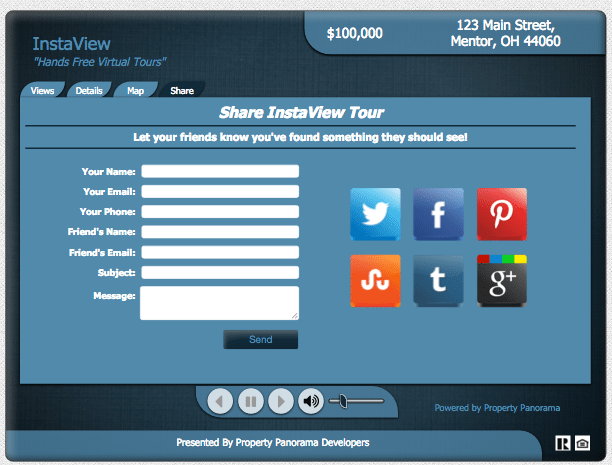 Property Panorama’s InstaView is a marketing content creation service for real estate brokerages. 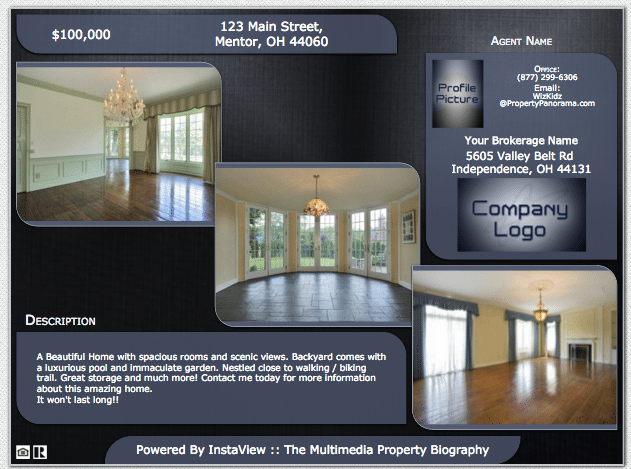 For the most part, Property Panorama’s visuals are dated and mundane. 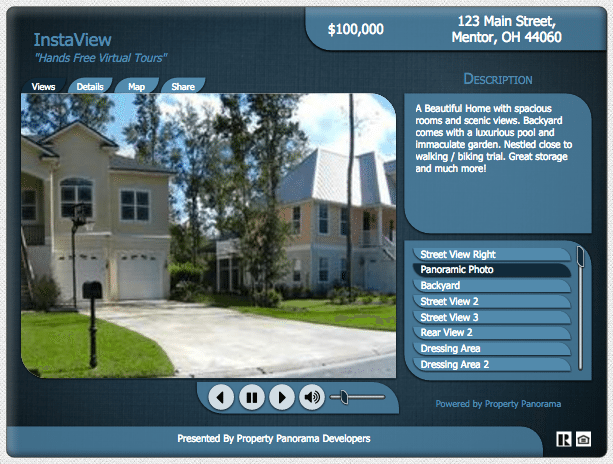 Virtual tours and videos are slideshows, not actual interior tours of listings or live action property showings. In the age of Matterport, customers may expect more. If you’re a broker wanting to make it as easy as possible for your agents to market listings, Property Panorama’s InstaView Enterprise Broker Solution is a worthwhile consideration. Once connected to your brokerage’s IDX feed and agent ID, an array of branded listing collateral is automatically generated. In most cases, it’s delivered within an hour. InstaView (for the sake of brevity) content is accessed from a single player window on a “custom” URL. Brokers can choose to a URL native to their brokerage or use “instaview.brokerage.com,” for example. Each listing is showcased in a number of formats, ranging from a PDF brochure to an animated slide show of images. A virtual flyer seems redundant to me, although it’s available, too. Everything published is pulled from what’s loaded into the MLS. While InstaView has a process for re-naming images not given specific identifiers when uploaded to their source MLS, it would benefit brokers to create naming and image capture standards. This can help InstaView maintain its rapid turnaround and ensure consistent presentations. An automated slideshow of images is not a video, nor is it a virtual tour, regardless of it being published on YouTube or having a triangular “play” button hovering over it. InstaView does allow for agents to add links to existing video content they may have on a listing. It will not be hosted by InstaView, however. Agents can also add voice-overs to the slideshows, or music, or choose to require contact information before viewing. All InstaView content can be shared easily to multiple social media channels, as well as emailed. The source of your traffic is marketing data that should be leveraged often. Knowing the source of your traffic, easy to do with InstaView, is a valuable bit of marketing data that should be leveraged often. Despite our contrasting views on what constitutes a video, InstaView’s partnership with YouTube will benefit brokers. It’s the second-largest search engine on the planet, boasting more than 1 billion unique users. Having a channel under your brand and a consistent stream of content generated makes an InstaView account instantly worth it. Unless you already have one. There’s a ton of additional content InstaView can include, like school demographics, links to preferred vendors, QR codes and even a CD/DVD download. No VHS, however. When it comes to balancing quick turnaround and quality content, I prefer ListReports. It’s visually more sophisticated, contemporary and shares more supporting content for each listing through its series of infographics, ratings and single-listing websites. However, for brokers wanting control of their brand — something I strongly advocate for — and a way to ensure agents’ listings reach the public, InstaView may be the better way to go.